Groupon.com is offering a special 10% off promo code today! You can save an extra 10% off new Getaways deals on Groupon when you enter the promotion code NEWTRIP10 at checkout! This is a 2-day only sale that ends tonight (Wednesday, May 7, 2014 at 11:59pm PT) so don’t miss out! I browsed around and there’s an amazing selection of getaways/travel deals. There’s deals to Hawaii, Las Vegas, Florida, LA, Mexico, Cabo San Lucas, Bahamas, England, France and Italy. Click here for a direct link to see all of Groupon’s new Getaways deals. 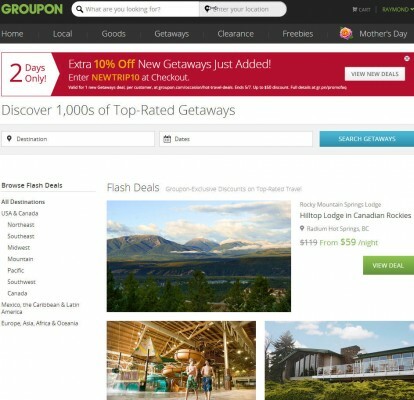 This is a hot deal because Groupon rarely offers promo codes and most of their getaways/travel deals is already discounted 50-95% off. You’ll find some amazing deals with the extra 10% off. There’s a limit of one code per customer with a maximum discount of $50. Hurry, only a limited amount of people can use the code so take advantage of the offer while you can! Click here for a direct link to see all of Groupon’s Getaways deals. Click here to view all of Groupon’s latest local daily deals.